For the item in the Pokémon series of role-playing video games, see Gameplay of Pokémon § Evolutionary stones. 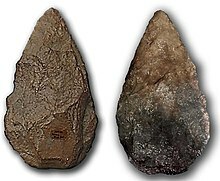 Throughout Africa, Europe, and Asia flint arrowheads and axes turned up by farmer's plows were considered to have fallen from the sky. They were often thought to be thunderbolts and are called "thunderstones". It was not until travelers returned from far-away places where these implements were in actual use that the origins of these objects became known. Even then, these travelers' tales received little popular credence. Axe heads found at a 2700 BC Neolithic manufacture site in Switzerland, arranged in the various stages of production from left to right. In Scandinavia thunderstones were frequently worshiped as family gods who kept off spells and witchcraft. Beer was poured over them as an offering and they were sometimes anointed with butter. In Switzerland the owner of a thunderstone whirls it, on the end of a thong, three times round his head, and throws it at the door of his dwelling at the approach of a storm to prevent lightning from striking the house. In Italy they are hung around children's necks to protect them from illness and to ward off the Evil eye. In Roman times they were sewn inside dog-collars along with a little piece of coral to keep the dogs from going mad. In Sweden they offer protection from elves. In the French Alps they protect sheep, while elsewhere in France they are thought to ease childbirth. In Burma they are used as a cure and preventative for appendicitis. In Japan they cure boils and ulcers. In Malay and Sumatra they are used to sharpen the kris, are considered very lucky objects, and are credited with being touchstones for gold. Among the Slavs they cure warts on man and beast, and during Passion Week they have the property to reveal hidden treasure. In the British Isles some idea of their original use is retained, and they are often referred to variously as elf arrows, elf bolts, elf darts, or fairy arrows, and are said to have been shot by elves or fairies at a person or animal to bewitch them. On the other hand, they are thought, for the most part, to protect the possessor from these little people. The presence of flint instruments found in British cinerary urns of the Roman Era is explained by two theories: 1) they were used by the mourners to lacerate themselves; 2) flints (like all fire-producing stones) are potent magic for preventing the return of the dead. In Ireland flint stones are soaked in water to make a medicine which is good for man or beast. Mounted in silver they are worn as protection against elf-shot, i.e. elf- or fairy-inflicted disease. In North Carolina and Alabama there is a belief that flint stones placed in the fire will keep hawks from molesting the chickens, a belief which probably stems from the European idea that elf arrows protect domestic animals. In Brazil, flint is used as a divining stone for gold, treasure and water. During the Middle Ages many of these well-wrought stones were venerated as weapons, which during the "war in heaven" had been used in driving forth Satan and his hosts; hence, in the 11th century the Byzantine emperor sent to the Holy Roman emperor a "heaven axe"; and in the 12th century a Bishop of Rennes asserted the value of thunderstones as a divinely appointed means of securing success in battle, safety on the sea, security against thunder, and immunity from unpleasant dreams. Even as late as the 17th century, a French ambassador brought a stone hatchet, which still exists in the museum at Nancy, as a present to the Prince-Bishop of Verdun, and claimed that it had healing properties. The flint was an object of veneration by most American Indian tribes. According to the Pawnee Origin myth, stone weapons and implements were given to man by the Morning Star. Among the K'iche' people of Guatemala, there is a myth that a flint fell from the sky and broke into 1600 pieces, each of which became a god. Tohil, the God who gave them fire, is still represented as flint. This myth provides a parallel to the almost universal belief in the thunderstone, and reminds us that Jupiter (mythology) was once worshipped in the form of a flint stone. The Cherokee shaman invokes a flint when he is about to scarify a patient prior to applying his medicine. Among the Pueblos we have the Flint Societies which, in most tribes, were primarily concerned with weather and witchcraft, but sometimes had to do with war and medicine. In many parts of southern England until the middle of the nineteenth century, another name commonly used for fossil Echinoids was 'thunderstone'. This was a name that in all likelihood formed part of another folk tradition that was almost certainly brought to Britain by Danish and Anglo-Saxon invaders more than 1500 years ago. In 1677 Dr. Robert Plot, the first keeper of the Ashmolean Museum in Oxford, published his classic book The Natural History of Oxfordshire. Plot recorded that in Oxfordshire what we now call fossil echinoids were called thunderstones, as they were thought to have descended from the heavens during a thunderstorm. The St. Peter's Church in Linkenholt, England, was built in 1871 near the location of the old St. Peter's, which had stood for nearly 700 years. The 1871 version of the church included fossil echinoids built into the walls surrounding the windows, a style adopted from the original. This implies that Thunderstone folklore was retained for at least 700 years in England, and had its roots in pagan folklore. Andrew Dickson White described the discovery of the true origin of thunderstones as a "line of observation and thought ... fatal to the theological view". In the last years of the sixteenth century Michael Mercati tried to prove that the "thunder-stones" were weapons or implements of early races of men; but for some reason his book was not published until the following century, when other thinkers had begun to take up the same idea. In 1723 Antoine Laurent de Jussieu addressed the French Academy on "The Origin and Uses of Thunder-stones". He showed that recent travellers from various parts of the world had brought a number of weapons and other implements of stone to France, and that they were essentially similar to what in Europe had been known as "thunderstones". A year later this fact was firmly embedded in the minds of French scientists by the Jesuit Joseph-Francois Lafitau, who published a work showing the similarity between the customs of aborigines then existing in other lands and those of the early inhabitants of Europe. So began, in these works of Jussieu and Lafitau, the science of ethnology. It was more than 100 years later, after the French Revolution of 1830, that the political climate in Europe was free enough of religious sentiment for archaeological discoveries to be dispassionately investigated and the conclusion reached that human existence spanned a much greater period of time than any Christian theologian had dreamt of. 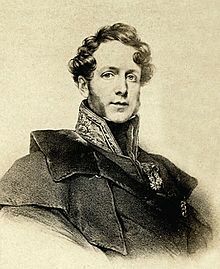 In 1847, a man previously unknown to the world at large, Boucher de Perthes, published in Paris the first volume of work on Celtic and Antediluvian Antiquities, and in this he showed engravings of typical flint implements and weapons, of which he had discovered thousands upon thousands in the high drift beds near Abbeville, in northern France. So far as France was concerned, he was met at first by what he calls "a conspiracy of silence", and then by a contemptuous opposition among orthodox scientists, led by Elie de Beaumont. In 1863 the thunderstone myth was further discredited by Charles Lyell in his book Geological Evidences of the Antiquity of Man. Lyell had previously opposed the new ideas about human antiquity, and his changing sides gave further force to the scientific evidence. ^ a b c d Leach, Maria. ""Flint"." Funk & Wagnalls Standard Dictionary of Folklore, Mythology, and Legend. 3rd ed. New York, New York: Funk and Wagnalls, 1972. Print. ^ a b McNanamara, Kenneth. (2007). Shepards' crowns, fairy loaves and thunderstones: the mythology of fossil echinoids in England. Myth and Geology, (273), 289-293. This page was last edited on 18 February 2019, at 18:49 (UTC).